Denmark – Jaime Kurtz, Ph.D.
Week two began with a daytrip to the college town of Lund, in southern Sweden. This is a great place to escape the city, relax, check out the cathedral you see above, perhaps collect some data, and definitely eat some delicious cardamom buns. One of my favorite things about Lund is a lovely botanical garden, where we had a class meeting and discussed the concept of flow. The garden’s colors weren’t as vivid as last year’s, probably due to a drought, but we still found some nice patches. Today was our last full day in Copenhagen. We had a fairly long class, mostly on work-life integration and “busyness bragging”. Lunch was all about going to favorite places one last time: the organic hotdog cart, the bagel shop, that one ice cream/churro place, coffee coffee coffee. Dinner was a pre-ordered meal that was…hilarious. Joe and I were staying in the Norrebro neighborhood, which was ground zero for the first night of Distortion, a massive music festival that is better described in photos. Just imagine this scene over a square-mile or two. And imagine us trying to wheel huge rental bikes through this. We were not popular. This was our day to travel to Stockholm, a five-hour train ride that left at 8:20 a.m. Despite a few snafus for Joe and me (a cab that didn’t show and my desperate plea to a stranger to please drive us to the station), it all went smoothly. This is always a great chance to catch up on sleep and reading. The students met with a DIS rep to take them to their housing, which is north of the city in a suburban area called Sollentuna (I remember this by picturing a mopey fish). Joe and I settled into our Gamla Stan (“Old Town”) Airbnb and immediately watched the previous night’s series finale of The Americans. Priorities. Today started with a summertime must-do: a lunch cruise into the Stockholm archipelago, a chain of 30,000+ islands that stretches east from the city into the Baltic Sea. Many Swedes have summer houses and boats here (1 in 10 Swedes owns a boat) and it’s an important part of warm-weather recreation. Weather is usually a primary concern for me on this study abroad, because so many of our activities are outdoors. But it’s barely mentioned here because we continue to be so ridiculously lucky! After the cruise, we had a class meeting on the small island of Skeppsholmen. Topics were friluftsliv and the feeling of awe, both very appropriate for the day. There was some Gamla Stan wandering, too. As a well-preserved medieval town, pretty much everything here is photo-worthy. We found the oldest statue in Stockholm, the “little boy who looks at the moon,” and rubbed his head for good luck. 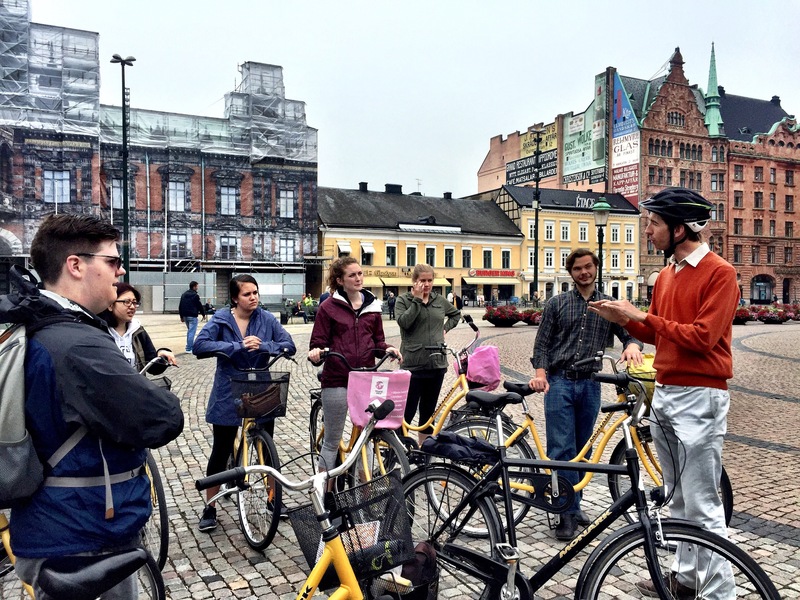 Today was largely a free day for students to collect data and explore Stockholm. I had planned to run the marathon (read all about that here) and was so happy and surprised that a group of students chose to spend a few of their free hours watching and cheering. In the evening, most of us went on the Stockholm Ghost Walk, a tour of Gamla Stan that gives us a dark lesson into the history of Stockholm: mass executions, brothels, doomed searches for buried treasure, and not one, not two, but three different types of the plague. And lots of restless spirits. Good fun. Yet another beautiful day to spend outside. We all took the streetcar to Skansen, the world’s oldest outdoor museum. It’s massive and has all kinds of exhibits about traditional Swedish life (imagine a Swedish Colonial Williamsburg), but the Nordic animals were the biggest hit. A big class day. The DIS facilities here are housed in the Royal College of Music. They practically require a retinal scan to access, but they’re quite nice when you do. Stockholm’s metro is sometimes called the world’s longest art museum. Anyway, we had a morning class meeting, a lunch break, and an afternoon guest lecture on Swedish politics from DIS professor Steve Turner, an American who’s been living in Sweden for 40 years. This was an intellectual high point of last year’s program, and was perhaps even more so this year, given the increasing frictions here and an important upcoming election. It’s all too easy for us to leave here feeling like the Scandinavian countries are doing everything right while we are, umm, not. This lecture highlighted the complications of implementing the social welfare system and the moral conflicts woven into immigration policy. In short, it filled in some important gaps. Today began with class. We first debriefed and discussed the previous day’s guest lecture, then everyone briefly presented their individual project findings. Our allotted two hours of classroom time flew by. We broke for lunch, packing time, and time to do all of those last things. We met for a last group dinner at a Stockholm mainstay, Kvarnen. We finally got our fill of Swedish meatballs. After dinner, we searched in vain for a karaoke place. Finding none, we settled for some very non-Swedish street singing, an Irish pub, and a late-night subway ride with a fire extinguisher incident that I need to learn more about (everyone is fine). united – this group of 13 was often all together, and when they weren’t, I could never identify any cliques or anyone who wasn’t a part of things. Everyone seemed to genuinely like each other and look out for one another. I saw a ton of compromise, empathy, and good humor, even in stressful situations. zany – I never worried about them being bored. They could create fun wherever they went, whether by killing a half hour by making their own beatbox band (complete with a few singles, an album cover, and a t-shirt design), cheering like mad at a marathon (generally not thought of as a great spectator sport), laughing their heads off at a catastrophically bad meal, and certainly many shenanigans I never heard about. It was so much fun to be a part of this crazy crew. They reminded me to worry less and to laugh a lot more. My last day here. The students seem to have taken the sunshine with them, literally and figuratively. It’s Swedish National Day (think a toned down version of the 4th of July in the U.S.). Many things are closed, my energy is sapped, and it’s suddenly 50 degrees and cloudy. In other words, it’s a good day to blog, pack, and eat one last cardamom bun. We arrived for the fourth year of Exploring the Good Life in Scandinavia yesterday at 7:30 a.m. Thanks to a stellar movie selection and a fussy seatmate, I got about two hours of terrible sleep on the flight. Unfortunately, we had a lot of morning and afternoon to kill before we could crash out. After a massive Espresso House coffee, I did my favorite Copenhagen thing and got a bike from a bike share stand. These things have little motors, so you can ride them even when you’re completely drained of energy. It’s super-easy to set up an account, and there are drop-offs all over the city. To call Copenhagen a bike-friendly city is a massive understatement, and–if you’re comfortable on two wheels–riding around here feels safe and natural. I never feel more at home in Copenhagen than when I’m on a bike. I started from Central Station and pedaled around with no real plan. If I felt lost or confused, I’d just follow someone for awhile. I ended up riding 11 miles before dropping the bike off and going to a meeting, more refreshed than I could have imagined a couple hours before. And some new treats too, like this adorable block-long street that I may never find again. I recently posed this question to my class of 13 JMU students as we neared the end of our 18 day, short-term study abroad class in Sweden and Denmark. Eighteen days may not look like much time on the calendar, but it’s jam-packed with novel and challenging experiences: sleeping four to a room, learning public transportation in a foreign city, coping with jet lag, living out of a suitcase, trying new foods, considering new ideas, and being very, very far from home. Plus, several of the students had never traveled internationally before, and most had never done so on their own. So, if they were to stop and reflect, important insights were right there for the taking. Travel can always teach us something — about the broader world around us, but also about ourselves. Thanks for the memories, you guys…and for the lessons you always manage to teach me. Did I mention that we lived for a week in a castle? I typically get a little down every year, right around this time. The days are getting dramatically shorter, the windows are soon to be sealed shut, and my bright summer dresses have been relegated to the back of the closet. To pass the time between November and March, I’d binge-watch and binge-read and count the days until my self-imposed hibernation ends and the warm Virginia weather returns. What changed? Well, a couple of years ago I learned about the Danish concept of hygge, and this winter, I vow to bring more of it into my life. Hygge (pronounced – kind of – like HOO-ga) is one of those untranslatable foreign words that suggests a way of thinking that we Americans just don’t quite grasp (but a fun attempt to define it is here). It roughly translates to coziness, contentment, and lack of anything unpleasant. It can be found in quiet conversations with friends, in candles, fireplaces, snuggly robes, a glass of wine, warm blankets, or steaming coffee. A hyggeligt (the adjective form of hygge) environment is your safe haven. In Denmark, hygge is practically a survival strategy in the long, cold, and very dark winters. The sun goes down around 4 p.m. and doesn’t rise again until mid-morning. That means that anyone who is employed in the traditional working hours has little opportunity to experience daylight. And this deprivation drags on for months. This sounds like a recipe for depression, yet Danes are constantly rated among the world’s happiest people. As many have suggested, hygge may play a key role. And, unlike universal health care, generous parental leave, and subsidized college education, the beauty of hygge is that it’s something we can easily import to States. What does make me feel warm, safe, and snug are these slippers (seriously worth the splurge), these candles (not a splurge at all! ), watching reruns of Gilmore Girls, looking through old photos, or reading a good novel with a lot of lights turned on. Even better if I can smell something yummy cooking. (Slow-cooker meals, therefore, are very hygge.) And that pile of books and papers? That has got to go. Start by checking in with yourself and coming up with your personal definition of hygge. And get your family in on the discussion too! Here are some great tips for working hygge into family life. Hygge is most definitely not fancy. It’s not pretentious or status-conscious. No judgment, no posturing. Cast aside your need for perfection. Don’t put off inviting people over because you still have to replace those broken kitchen tiles or perfect your recipe for coq au vin. Sharmi Albrechtsen, who frequently blogs about Danish happiness, once told me that trying to one-up or impress your friends and family with fancy food and drink is pretty much the opposite of hygge, as it doesn’t foster warm feelings at all. Instead, hygge is modest, comforting, and familiar. This recent trend, then, might just be perfect. Don’t hibernate. Stay social. Winter can foster a real sense of isolation as we hunker down and close the world out. But Danes stay social in the winter, having small gatherings, going to snug cafes, and getting really, really psyched for Christmas. Christmas is huge in Denmark. It seems as if all of December is spent gearing up – preparing food, decorating, visiting friends. And the big event? With the lighting, music, family, friends, and traditional foods, you might say it’s hygge at its finest. Want to read more about hygge and related concepts? Here’s a fascinating take on how people can thrive in harsh winters around the Arctic Circle (in Norway, but still). Author and reluctant Denmark transplant Helen Russell explores hygge and Danish happiness in The Year of Living Danishly. And I can’t wait to see what Danish happiness researcher Meik Wiking has to say in the forthcoming Little Book of Hygge. It’s been two weeks since I said goodbye to my second summer study abroad class. It’s officially called Exploring the Good Life in Scandinavia, offered though James Madison University. Last year – the first time out – was hard. I mean, I was alone in a foreign country and in charge of eleven students, taking them places even I had never been before. Our hotels and restaurants hadn’t been vetted. I had never met the Malmo University staff who were to host us for a week. I didn’t understand how to use the JMU-provided Excel spreadsheet to document my expenses. I didn’t really understand how to use Excel, period. (Ok, ok. I still kind of don’t.) Shoot…I didn’t even know what I didn’t know! This time, with my Excel-savvy boyfriend along and a year of experience under my belt, I expected it to be a breeze. I knew how to navigate the streets and the public transportation. I had a list of decent restaurants suitable for groups. I had class materials prepped. And everyone there speaks English. Yes, I was feeling fine. But, guess what. It’s still hard. Like, really hard. In no other realm of life do I wear so many hats, trying to be an unflappable, savvy tour guide/professor/accountant/surrogate parent with a steel trap memory and encyclopedic knowledge of Scandinavia. To be sure, some of the pressure I feel is absolutely of my own creation. For example, one night we were at a very fun and hip taco joint. I was required to pre-order our dinners because we were such a large group. A few days prior, I told the students they could choose between cod, steak, or vegetarian tacos. I dutifully emailed the restaurant our order, and as the food came out, I saw that it was not tacos, but full entrees. The students were pleased, actually: it looked delicious and the portions were huge. But I felt weirdly awful and incompetent. How did I screw this up? Even as I was surrounded by happy, laughing students, I seriously thought, I just can’t do this anymore. Later, I remarked to Joe, “It’s just so hard being responsible for everyone’s happiness all of the time.” And then it hit me: no wonder I was a stress-case! Part of my job is to set the stage for happiness, yes. To create a feeling of safety and comfort and acceptance. But I can only get them so far up the hierarchy of needs. While this job does require many hats, “perfection ensurer” is not one of them. So, this time around one of several lessons I learned was that it’s really hard to be a die-hard people-pleaser in this role. I can only control so much. Food orders will be wrong, buses will be late, it will rain at inopportune times, and wifi will sometimes be spotty. Very little of this is my fault. Self-compassion is essential. So are head-clearing, early-morning, pump-up runs. I also learned that taking students abroad will probably always be really hard. Maybe it should be. A big group, in a foreign country, with goals of connecting, learning, and feeling safe but also challenged. It’s not something to be cavalier about. But it’s also the most rewarding thing I do: sharing fascinating and beautiful places, hearing the appreciative and awestruck reactions of my students, helping to set the stage for new friendships, teaching techniques for happiness, exposing students to new ways of living, and maybe even instilling a lifelong love of travel. So, when I step back and big-picture it, botched food orders and slow wifi fade from view. Instead, these recent memories mesh with my first time abroad and the way it shaped me. The fact that I might have some small role in doing the same for these students is both humbling and a great privilege. And when the students want a key class concept permanently etched onto their bodies, I have to consider it a success, right? “The Good Life” Comes to an End. As I write this, I’m three hours into a five-hour train trip, heading south from Stockholm to Copenhagen. A few cars up sit twelve drowsy college students who are probably alternating between napping, snacking, working on their final course presentations, and – quite possibly – reflecting on the fact that it’s almost over. We’ve just spent the past 16 days touring Sweden and Denmark on a study abroad called “Exploring the Good Life in Scandinavia.” We have just one last evening together in Copenhagen, and then they all start to disperse: some are off to Norway, one to Iceland, another to Berlin, and still another to Amsterdam. Others are going back home, back to their parents, siblings, graduate school prep, and summer jobs. And two of them graduated last month, don’t really know what comes next, and – understandably – really don’t seem to want to think about it. 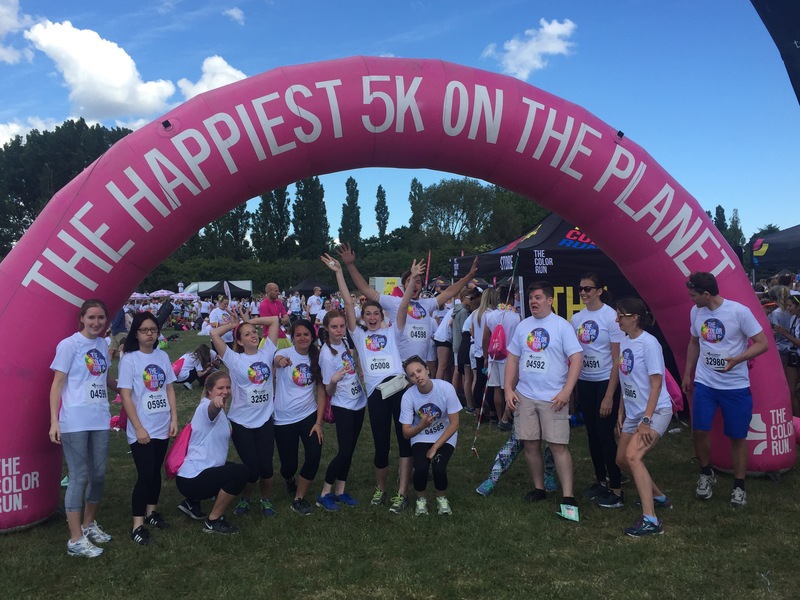 While our main objective was to study the well-documented high rates of Scandinavian happiness, we also did a Color Run, learned to make moose meatballs, biked through Malmo, and cruised through the Stockholm archipelago. We played hilariously bad beach volleyball, danced around a maypole on Midsommar’s Eve, and visited the Christiania commune just one day before it was infiltrated by cops on a drug bust. We found a cure for culinary homesickness at a TGI Fridays, laughed through a border crossing snafu at the Copenhagen airport, celebrated two birthdays, survived the rides at Tivoli Gardens, took a ghost tour of Stockholm, and sang karaoke at a Swedish dive bar. And I’m sure they would add things to this list that I will never know about. As it should be. What I do know is that three weeks ago, these twelve were virtually strangers, but now, I see the potential for life-long friendships. The time has been brief but intense. They’ve shared experiences that no one else will really understand. They have inside jokes and nicknames that would be lost on anybody on the outside. And they are united in the knowledge that their experiences here will never be replicated. As for me, I’m equal parts relieved that a stolen cell phone was our biggest disaster, happy to be free and responsible only for myself, and sad to be saying goodbye to this thoughtful, curious, and hilarious bunch. A few of them, I know I’ll probably never see again. A few will be in my class this fall. The rest may pop into my office once or twice. Maybe we’ll try to put together a reunion dinner. But, the cold reality is that we will never be together again, as a group, in this part of the world. This experience will never be repeated.